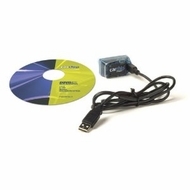 The CarChip Pro (# 8226) data logger records vehicle trip and performance data to provide a detailed history of driver performance and vehicle operation. Recorded data includes: trip start and end times, vehicle speeds, rates of acceleration and braking, and any detected OBDII trouble codes. The CarChip Pro also provides additional vehicle monitoring capabilities including the logging of additional engine data parameters and detailed “accident” data for all sudden stops. It can also emit an audible alarm whenever a driver exceeds user-determined speed limits. Using the included CarChip software, you can see the logged data in summary, record, plot, or table formats and also export it to other applications. The CarChip Pro data logger plugs into your car’s OBDII port and is compatible with most passenger cars and light trucks model years 1996 and later. All CarChip Pros require CarChip software version 2.3 or later. Easy installation: plug it in under the dash, drive your vehicle, then download the data to your PC.